The Spongebob Movie: Sponge Out of Water is absolutely baffling. It takes the surrealistic elements that have grown into the television series, and uses its theatrical budget to push them to the extreme. 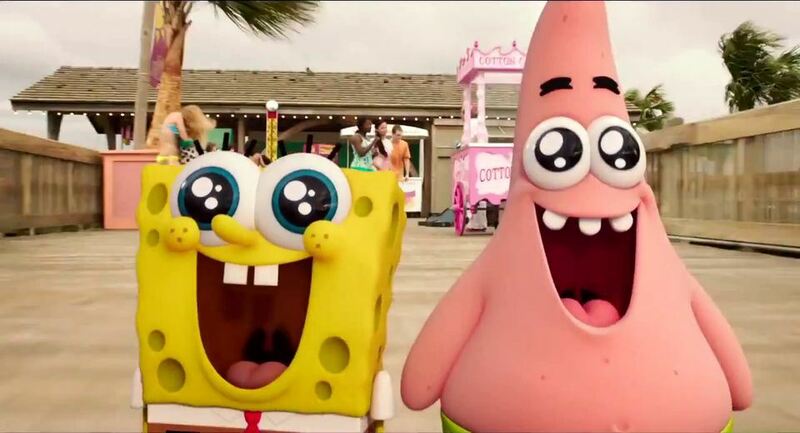 The end result is something that is often hilarious, and often disjointed, but it is always unmistakably Spongebob. 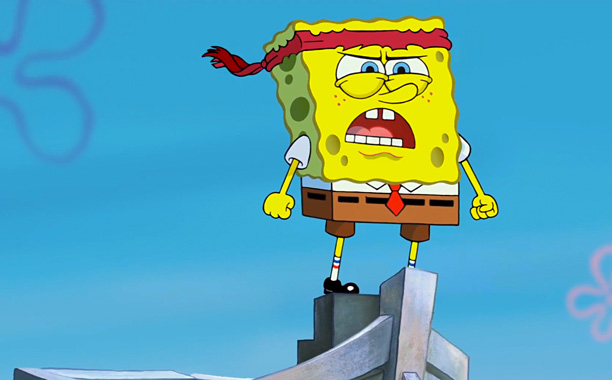 2004’s The Spongebob Squarepants Movie served as a fitting transition from small screen to big screen for Spongebob’s trademark nautical nonsense. It was appropriately bigger, but very much accessible for those unfamiliar with the series. It was ridiculous, but it felt focused, at least considering it was an hour and a half expansion of a normally eleven-minute format. The Spongebob Movie: Sponge Out of Water is much less focused, and unapologetically inaccessible to anyone outside of the Spongebob fanbase. In some instances, it works for its benefit, in others it feels lost in its own weirdness. 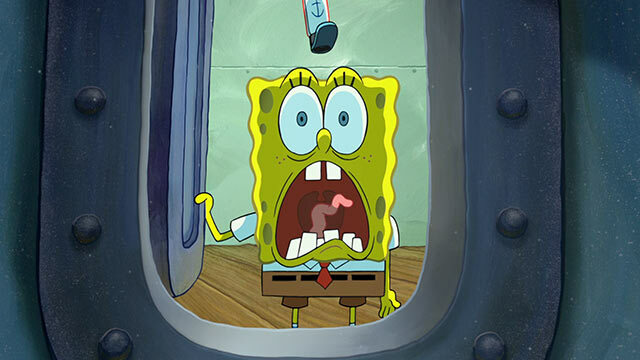 Many fans cry foul that Spongebob lost his way after the first movie, and that the series became dumbed-down, relying on gimmicks and an over reliance on surrealism over the clever writing of the older episodes. One could say that Sponge Out of Water brings with it the good and the bad that has been attributed to the series over the years. It’s well-written and witty when it wants to be, but oftentimes it abandons it own intelligence just to weird-out its audience, which can feel like a cheap and easy way to fill its running time after a while. The story – or what there is of one – is simple in explanation, but head-scratching in execution. Plankton is once again in the midst of trying to steal the Krabby Patty secret recipe when he gets into a scuffle with Spongebob. As they fight over the recipe, it magically vanishes from sight. Mr. Krabs, and every other Bikini Bottom citizen, suspect Plankton to be behind the recipe’s disappearance. Spongebob, having witnessed the inexplicable occurrence, defends Plankton. This leads to both Plankton and Spongbob being run out of town, and it’s up to them to set things right. It’s more complicated than that, however. 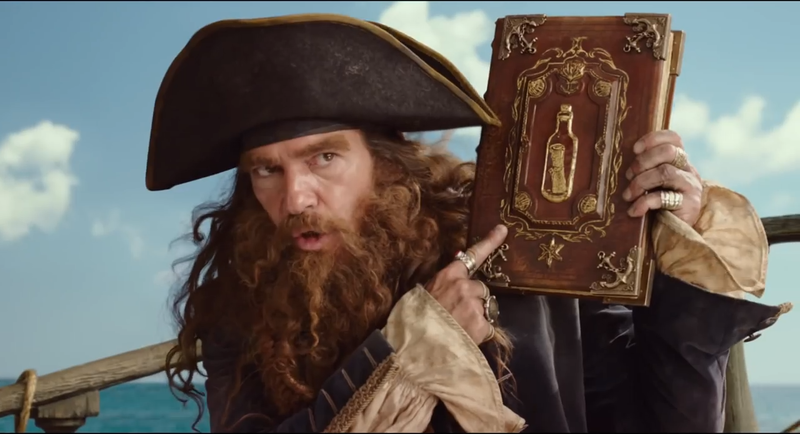 It turns out, a pirate named Burger Beard (portrayed by a live-action Antonio Banderas, who seems to be having a blast in the role) has stolen a magic book – which inexplicably controls the events of Bikini Bottom – and by writing in it, gave himself the Krabby Patty recipe, as well as making the few who knew the secret recipe forget it. Naturally, this sends Bikini Bottom into a Mad Max-inspired apocalypse. Before all is said and done, events like time-travel, an encounter with a psychic, rapping dolphin from the future, and Plankton’s umpteenth venture into Spongebob’s brain occur. It all culminates with a giant parody of The Avengers, in which Spongebob and company become super-powered CG versions of themselves, travel to the surface and do battle with Burger Beard. Again, this is a weird movie. On one hand, I applaud Sponge Out of Water for its weirdness. You’ve got to give credit to a movie like this for being itself and not pandering to audiences. When the weirdness works with the plot it’s hilarious (the aforementioned dolphin is involved with Spongebob becoming CG in a moment that feels like pure cinematic insanity). The problems arise when Sponge Out of Water’s weirdness works against the story. The primary plot seems to get abandoned entirely for a good chunk of the movie, and the partnering of Spongebob and Plankton – which seems to be the movie’s core relationship – kind of disappears in the third act. 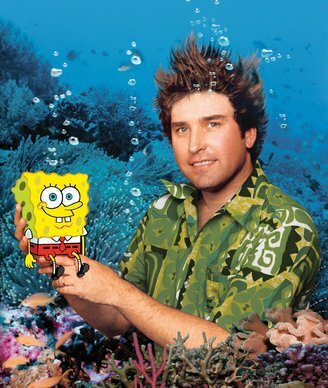 While the first Spongebob movie kept things simplified and focused, Sponge Out of Water is so determined to prove its weirdness that it forsakes its own story to do so. Because of that, the movie often doesn’t feel like a movie. Instead, Sponge Out of Water feels like a series of small episodic events, with the larger story only taking part in the earlier moments and the very end. But when it works, it works. Sponge Out of Water makes subtle nods to the show’s early years without forcing them, the movie parodies are clever, and when the writing and weirdness work together it’s close to genius. It’s just a shame it’s all so inconsistent. The Spongebob Movie: Sponge Out of Water is definitely the best Spongebob has been in years, but it still falls victim to some of the problems of the series’ more recent seasons. There are some humorous diamonds in the rough here, but with a little more attention given to the writing, it could have been a comedy goldmine.